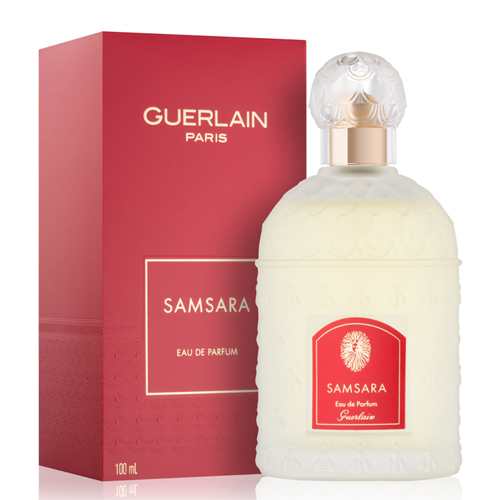 Guerlain Samsara is all the wisdom and beauty of the east, encased in an aromatic liquid. Guerlain Samsara EDP 100ml. is all the wisdom and beauty of the east, encased in an aromatic liquid. In Indian philosophy, the word samsara (translated from Sanskrit “transition, a series of rebirths”) is one of the key concepts and means the cycle of birth and death. The top notes of the pyramid consist of rather fresh aromas of bergamot, lemon and green notes, decorated with exotic ylang-ylang and peach. The heart of the fragrance is saturated with rich floral aromas of violet, iris, jasmine, rose and narcissus, which are woven together and fascinate with their many-voiced, but harmonious sound. Base notes of sandalwood, vanilla, amber, musk and tonka replace the rich floral fragrance, which, with their woody sound, form a luxurious, fascinating train. Perfume has a fairly concentrated, thick aroma, intended rather for use in special cases, rather than for daily use. Regarding the seasons, it is preferable to use the fragrance in winter or late autumn. This breathtaking scented water from the luxurious Guerlain brand is great for both romantic and everyday use. Awaken in yourself passion and give up temptation! Discover the unsurpassed possibilities with Samsara fragrance from Guerlain! Fragrance classification: oriental, woody, spicy. Top notes: bergamot, lemon, ylang-ylang, peach, green notes. The note "Hearts": jasmine, iris, violet, ylang-ylang, rose, narcissus. Final note: sandalwood, vanilla, tonka bean, amber, musk.